Cupcake Cutie can provide cupcakes for your christening or baby shower. Simply contact the team with your requirements. 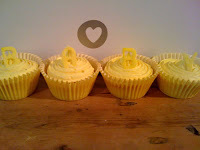 We can provide yellow "BABY" cupcakes for a baby shower or we can tailor them if you know if you are having a beautiful baby girl or a bouncing baby boy. Or maybe just something cute and adorable like a little girly selection for all of your friends and family at the shower, christening. Cupcake Cutie can provide cupcakes on both small and large scale. 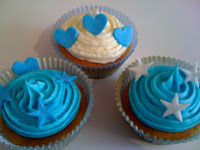 If you are an event planner we can provide cupcakes for your events. 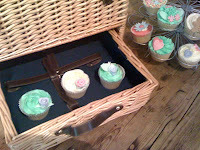 We work along side our clients to ensure the cupcakes perfectly suit their event. We have provided cupcakes for companies such as the BBC , Sky Media , Eon , Present Time UK , BIU to name a few. Venues have included BBC , NEC , NIA , Hilton Hotels , Grosvenor Hotel , Marriott Hotels and many more. If you would like to discuss your charity event cupcakes , gala dinner cupcakes , company party cupcakes , corporate cupcakes please contact the team. 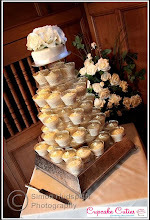 So valentines day yesterday may have inspired many proposals for the big "I do" , so if you are planning a wedding, why not add the wonderfully stunning cupcake tier. Not only do they look a beautiful display to match your wedding theme, there are also tasty , very easy to eat. You could also have the traditional top cake to ensure those traditional cake cutting photographs can be in your big day albums. 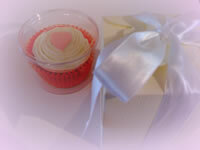 Cupcake Cutie, can tailor the cupcakes to match your wedding colours and wedding themes. Vintage , chic , glamourous , idilic , romantic , delicate , bold , fairytale , winter wonderland - any wedding theme can be tailored to. We can provide samples. We will deliver to the venue on the day and set up the tiers for you. 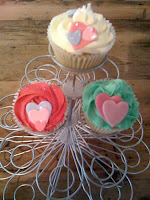 We will be on hand on the lead up to the big day to make sure your cupcakes are perfect for your requirements. 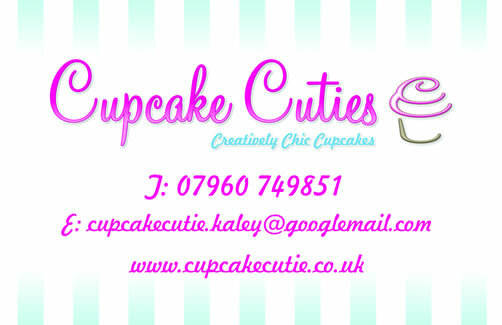 Cupcake Cutie can provide a vintage cupcake stall for your wedding or event. Cupcakes can also be coloured to suit your theme, so if you prefer cath kidson vintage then we can provide a chic pastel assortment with paisley and spotted designs. 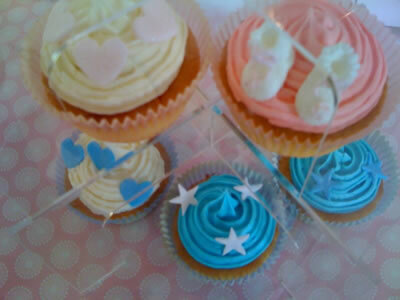 A selection of vintage themed cupcakes , on tiers and scattered on the table look great . Cupcakes in hampers and wicker baskets , creating the country bumkin look is essential for a vintage country themed stall..
Prices vary depending on amount of cupcakes desired. We will provide a member of staff to serve your guests.